Why is My Heat Pump Not Cooling? When you think about climate control in your home, you probably think a lot about your air conditioner or heater, right? That’s all well and good. Those systems do pull the majority of the weight when it comes to keeping your home comfortable. That’s not the entire ball of wax, though. There are other parts of the system that need to be in top shape for your climate control to work properly. Let’s take a look at a key part of your home’s climate control system: your ducts, and how you can make sure that they work to your benefit. You probably don’t think about what your ducts actually look like that much. Most people don’t. Not all ducts are the same across houses, though! The size of your ducts, what they’re made of, and where they’re located can all dramatically change the efficiency of your climate control systems. For example, if your ducts are too narrow for the kind of air conditioner or heater you’re using, they can restrict the airflow throughout your home. This lowers your system’s energy efficiency and makes it harder for you to stay comfortable. The best way to avoid this is to have a professional take a look at your ducts, and make sure that they’re properly sized and fitted for the systems they’re attached to. Even if your ducts are properly sized, it’s important that you do your part to keep them functioning properly. Mostly, that just means getting them professionally cleaned about every 5 years. Ducts often serve as a gathering place for all kinds of dust and other contaminants over time. This drops your indoor air quality, but it can also insulate your ducts, making it more difficult for air to flow through them. 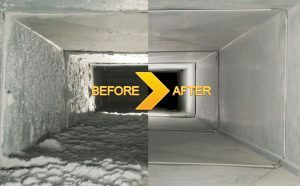 Duct cleaning ensures that your ducts will stay clear, and improve your indoor air quality at the same time. Ducts are, unfortunately, very prone to developing leaks over the years. Whether because of improper installation, lack of maintenance, or even animal activity, you could have small leaks scattered throughout your ductwork without you even realizing it! Duct leaks are often quite small, but they add up quickly. The US Department of Energy estimates that the average home loses as much as 30% of its total climate control output to duct leaks. That’s almost a third of your climate control going to waste! Fortunately, you can prevent this from afflicting your home by having a professional seal your ducts every few years. This will restore your lost output, save you money, and make it easier for you to stay comfortable in the future. Area Heating & Cooling, Inc. provides a full range of air duct testing and sealing services in Vancouver, WA. If you need your ductwork analyzed and maintained, contact us today to schedule an appointment with one of our professional duct technicians. We’ll make sure that your ducts are in top condition for as long as possible.